Boat trailer lights are easy to understand and change. How often do you check your boat trailer lights? The lights should be checked every time the boat trailer is made ready for towing. Because most boat trailer lights are submerged when launching and loading the boat, lighting system malfunction can be expected at some point in time. Water, especially brackish and salt water, is very corrosive to the metals in light assemblies. Keeping water out of a light assembly means maximizing the trailer lights usefulness. Some light assemblies are designed to be completely air tight, while others may trap a bubble of air in a effort to prevent water from contacting the bulb and bulb assembly. Regardless of the design, there will come a day when upon checking the boat trailer lights, the boater will find that one or even both lights have failed to illuminate. The first thing most boaters will do is check the connectors at the vehicle to ensure everything is “ hooked up”. When upon farther examination and generally with a great deal of aggravation, out comes a screwdriver to remove the light assembly cover in the hopes that only a bulb change is required. At this point, the boater often discovers that the entire light assembly has corroded beyond repair and a new light assembly is needed. For those of us who like to do things ourselves, a basic understanding of trailer lighting systems is helpful before proceeding. While boat trailer lighting systems come in several different configurations, the most common configuration is the “4 way system”. Thus called because the system requires only four wires to provide all the essentials necessary to operate the trailer’s tail lights (running lights), brake lights, and turn signals. 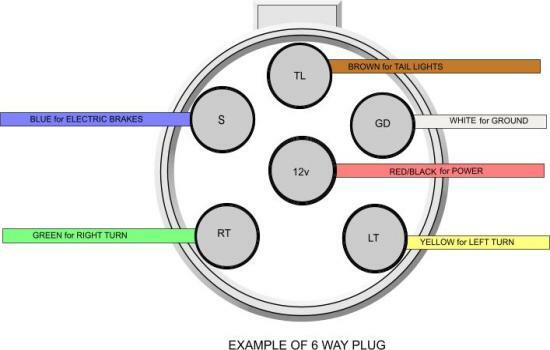 Generally, the 4 way system is patterned so that the right turn signal and brake light wire is green, the left turn signal and brake wire is yellow. 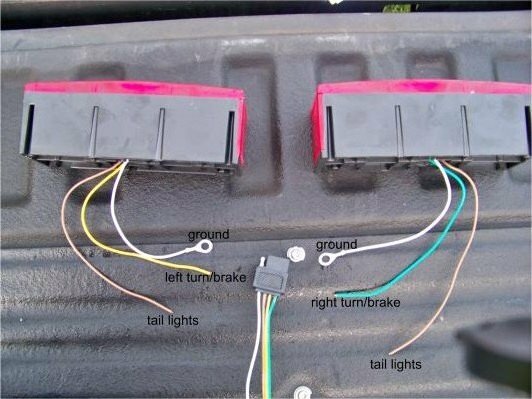 Tail lights, tag light, and side marker lights are powered using the brown wire, leaving the white as the ground. 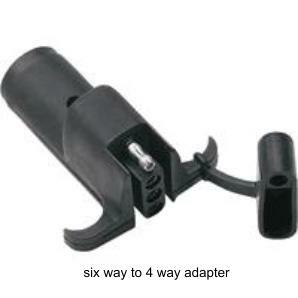 Other configurations such as 5 way, 6 way, and 7 way wiring systems generally expand off the 4 way configuration. For example, a 5 way adds an additional blue wire used to power auxiliaries such as boat trailer electric brakes. 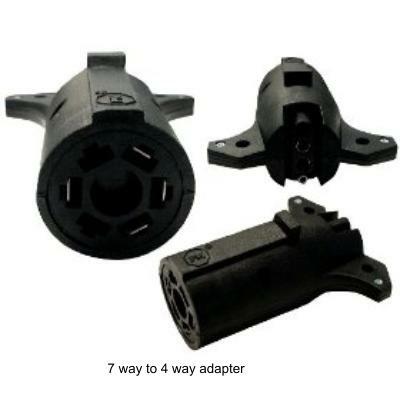 Note: if your vehicle has a 6 or 7 way connector and your boat trailer system is 4 or 5 way, a simple low cost adapter may be purchased eliminating the need to splice in a new connector. Changing the boat trailer lights is generally not a difficult job. Start by inspecting the vehicle to trailer connectors and all existing wiring. A circuit tester which has voltmeter and ohmmeter functions will verify that each wire is providing the necessary power. Do not waste time by trying to patch or repair problems with the old existing wiring or connectors. Complete trailer light kits are available that include everything needed to quickly and easily replace all the trailer’s wiring. Most often the metal frame of the trailer serves as the ground for the lighting system. Ensure the white wire is securely attached to the frame. Check for conductivity between the trailer’s connector and the frame, because a poor ground can cause an array of problems. For example, if during a boat trailer lights test the tail lights appear to operate normally, then as the brakes are applied one side of the lights brighten while the other side dims or fade out complete, this is a very common indication that the system has a poor ground. 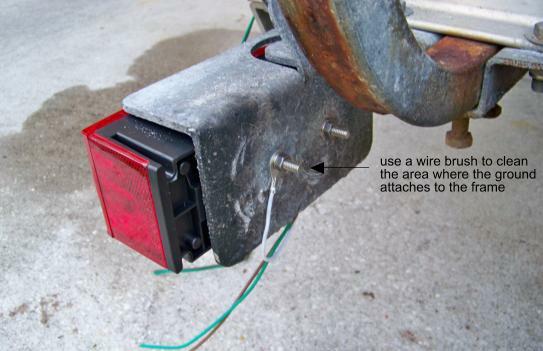 At the boat to vehicle connector the white wire should be attached to the frame securely and be corrosion free, if not, clean and reattach. 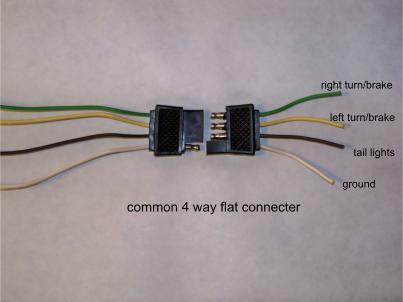 Once you have determined that all connectors and wiring is operating correctly and that the light assemblies need to be replaced be sure to purchase the proper assemblies. Do the light need to be the submersible type or of a low profile design? In most cases, if the new assemblies are closely identical to the old they should work. In many cases the removal of the old light assembly is the most difficult step of the whole process. This is because the attachment bolts and nuts on the old assembly are often corroded All new light assembly kits come with new hardware so use whatever method is necessary to remove the old lights even if this means using force. Sometimes a pry bar, hammer or bolt cutter may be required. Just remember to wear eye protection. Once the old light assemblies have been removed, the remaining steps include securely reattaching the new assemblies to the trailer with the hardware provided in the kit. Remember that the white wire provides the ground connection and in many cases will be attached directly to the trailer frame via this hardware. Use a wire brush or sand paper to clean the area where this ground is applied. 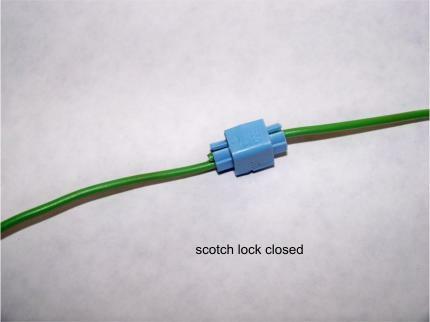 Next, simply match the “like” color wires of the assembly to those of the trailer wiring and apply the scotch lock. 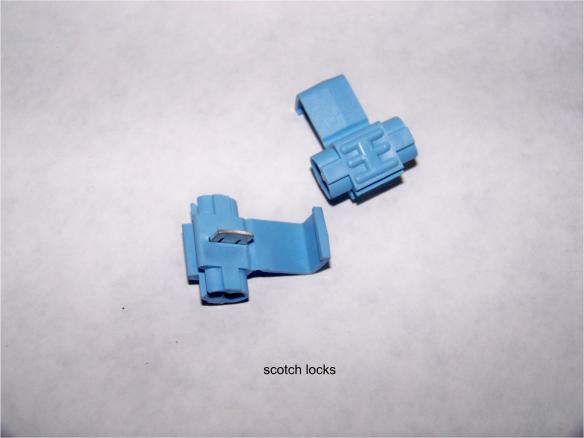 Scotch locks make this task easy and quick. 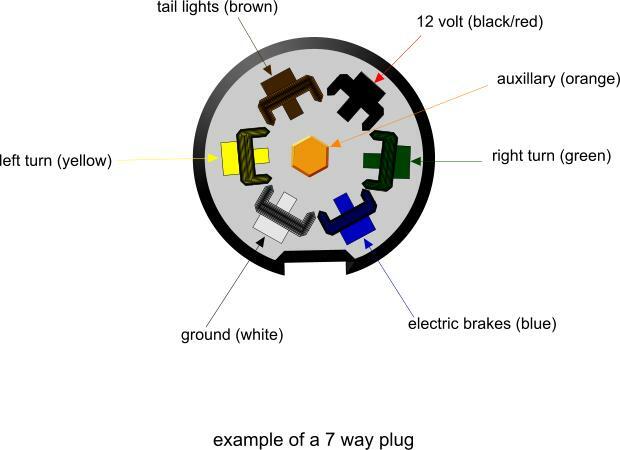 If using submersible light assemblies, the most likely future problem area will be the connection between the light and the wiring harness where the scotch lock has been applied. Cover the scotch lock with a coat of water resistance caulk or spray on corrosion inhibitor to provide a degree of protection against moisture and corrosion. Some boaters will unplug the vehicle to trailer connector before launching to prevent any possibility of a water contact short which may cause the vehicle’s fuse to blow. For many of them, however, remembering to plug the connector back before heading home is often the bigger problem. When changing all the lighting system components (especially the wiring harness), consideration should be given to reposition the light assemblies so they are never submerged. This may or may not be feasible with your boat/trailer configuration but it is worth a look.